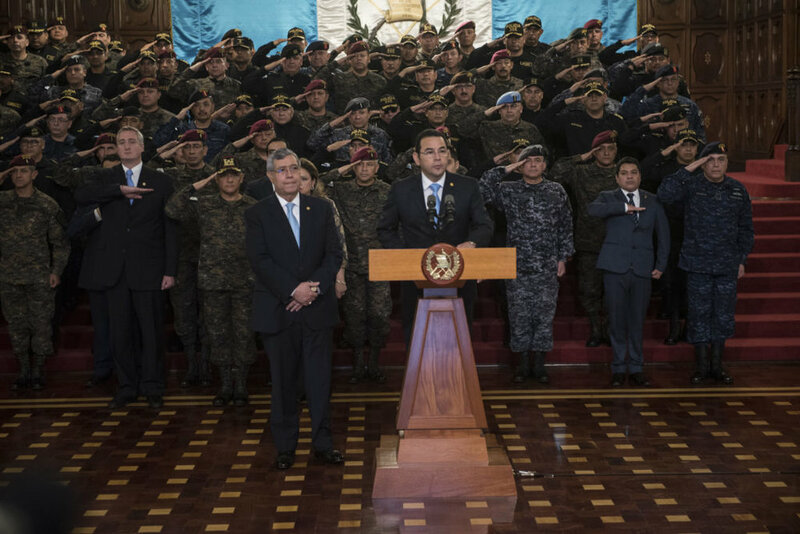 Guatemala is in the grip of a constitutional crisis that threatens to reinstate a regime of dictatorship and death squads supported by the U.S. government. This is the message that was delivered to me and my fellow members of a CRLN delegation to Guatemala by a variety of human rights activists in January of this year. Appalled by the looming threat to the modest progress toward righting the historic wrongs that continue to cast a shadow over public life in Guatemala, these activists deplored the recent U.S. retreat from its previous 12 years of support for the effort to bring justice to Guatemala and pleaded with us to help rekindle that support in the U.S. congress. Because of the urgency and importance of this moment, explained below, CRLN is forming a Guatemala Working Group. Call the CRLN office at 773-293-2964 or email shunter-smith@crln.org if you are interested in joining a CRLN Working Group on Guatemala. The United States, with a few notable exceptions, has been playing a relentlessly destructive role in Guatemala since at least 1954 when the CIA-engineered a coup that overthrew a democratically elected reformist regime because it was encroaching on U.S. business interests there. In the ensuing maelstrom of repression and rebellion the U.S. allied itself with the Spanish-descended economic elite and its military, supplying arms and training in support of a barbarous genocidal counterinsurgency that destroyed 440 Mayan villages and killed over 200,000 people, nearly all of them civilians. The heavy hand of the U.S. did not stop there. When survivors of these massacres and related repressions sought refuge in the United States, the Reagan administration barred them, thereby inadvertently giving rise to the Sanctuary Movement of churches and synagogues that sheltered these “illegal” refugees in defiance of the U.S. government. CRLN is a direct outgrowth of that sanctuary work in the 1980s. Over the years it has continued to stand with Guatemalans in their postwar pursuit of justice and to call out the U.S. government when it impedes that work. That is the background of the crisis that CRLN found during its January delegation. The current constitutional crisis has its roots in the crimes of the counterinsurgency. The long-delayed effort to bring the perpetrators to justice got a big boost about 12 years ago in a fleeting, breakthrough moment when the Guatemalan government, desperate for some measure of international and domestic legitimacy, agreed to cosponsor a United Nations Commission Against Impunity in Guatemala (CICIG, in the Spanish acronym). Its mandate was to assist the Guatemalan Attorney General in the development of prosecutions relating to crimes from the past as well as from the present. The U.S. supplied a portion of the necessary funding. The CICIG has become a victim of its own success. In its support of dozens of successful prosecutions of perpetrators of the genocide and of sitting politicians, including a sitting president and vice president, the CICIG has come to be seen as a threat to the allied business and military elites that have long dominated Guatemalan politics and government. It was the 1970s and 1980s threat to this same elite that caused it to launch the brutal counterinsurgency, so it is no surprise that it has launched a counterattack on the CICIG. The current crisis was precipitated by the present president of Guatemala who, along with his son and brother, has come under investigation and fears that they will be indicted for corruption. He and his allies for some time have been attacking the CICIG as an agent of foreign powers that are compromising Guatemalan sovereignty. They have even used high priced lobbyists to win the support of conservative politicians in the U.S. These attacks came to a head late last year when the president declared that he was ending the mandate of the CICIG. The resulting political crisis rapidly became a constitutional crisis when the Constitutional Court ruled that the president lacked the authority to terminate the CICIG unilaterally, the president defied the Court and withdrew police protection from the CICIG workers. He then sought to indict and remove the Court majority on charges that they had acted against the law by ruling against him. That is where things stand as of this moment in mid-February. It is painful to report that the United States has jettisoned its 12-year support for the CICIG. The State Department and the embassy have issued statements in defense of Guatemalan sovereignty and blandly said they favor the rule of law. They have remained pointedly silent on the CICG, in contrast with the robust support they have voiced in the past. Guatemalan human rights activists see the CICIG crisis as part of a larger drift toward dictatorship characterized by the reappearance of death squads, the criminalization of protest and opposition generally, and the subordination of independent branches of government to the control of the president acting on behalf of the old elite. Emblematic of this drift is proposed legislation that would void the convictions that the CICIG has helped to obtain and forbid further prosecutions of crimes committed during the counterinsurgency, thus reinstating the impunity on which elite rule has rested. In addition, a companion bill would subject nongovernmental organizations to onerous registration and reporting requirements and would outlaw many of their activities. If this bill is enacted many of the groups with which CRLN works would find it difficult or impossible to operate, and individual activists would find themselves in even greater jeopardy than they are at present. The awful developments in Guatemala create a particular moment for CRLN. As members of CRLN we are not powerless to resist Guatemala’s slide toward dictatorship. We must remain in contact with our partners there. We must contact U.S. officials and other leaders. We must spread the word so that our friends and associates in the U.S. can do the same. Because of the urgency and importance of this moment, CRLN is forming a Guatemala working group. All members are invited to join. I definitely will be participating. I hope many of us will. We have a lot of work to do. Call the CRLN office at 773-293-2964 or email shunter-smith@crln.org if you are interested in joining a CRLN Working Group on Guatemala. 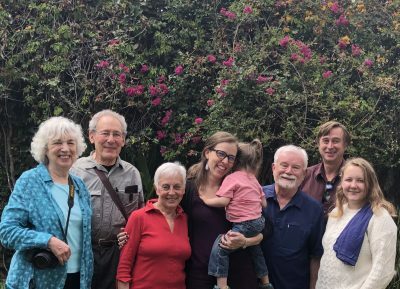 CRLN’s 2019 delegation to Guatemala was a very special journey of accompaniment, learning and solidarity. We visited rural communities and met with human rights organizations working to promote justice and peace in Guatemala. We shared meals with our Guatemalan friends, listened to their stories, and explored ways in which CRLN can continue to support their struggle to build a more just and humane society. Throughout our travels and visits, we endeavored to learn about the factors that cause people to leave their homeland and migrate to the US and the factors that could make them want to stay. New Hope (Chaculá): This year marked the 25th anniversary of the founding of this community of repatriated refugees, who fled genocidal attacks by the Guatemalan Army in the 1980’s. At their request to guarantee their safety, Martha Pierce provided international accompaniment for them as they made their way from the Mexican refugee camps to their new community, and a 25-year partnership began. Since 1994, CRLN and its predecessor, CMSA, have supported the community through annual visits on the anniversary of their return (January 12), support for international human rights accompaniers in the village, and scholarships for students at the local school from funds raised by CRLN’s Pedal for Peace Bike-a-thon. The dedicated young teachers at the school, many of whom have benefitted from these scholarships themselves, believe strongly that a good education will enable their students to remain in Guatemala, rather than migrating to the USA. The Roots of Migration: Our friends in Chaculá are trying to build their community and their lives in the midst of the ongoing challenges of economic inequality, racism, and corruption that fuel violence and cause some people to make the difficult decision to leave their homeland. In Chaculá, we could easily see the differences in living conditions for those who have family members in the North and those who do not. The violence that affects much of the country is felt in Chaculá as well. Situated very close to the Mexico border, they are quite aware of drug trafficking, as well as the passage of migrants through their area. Many people in Chaculá were mourning with the family of a young boy from a neighboring village, who had recently died in US Border Patrol custody. We had to cut our visit short by a day and return to the city, because people throughout the country were protesting the Guatemalan President’s efforts to end investigations into corruption and impunity that were being carried out by a UN-appointed commission known as CICIG. He defied a Constitutional Court order to allow CICIG to do its work, precipitating a constitutional crisis or “technical coup.” Everyone we talked to – villagers, taxi drivers, shop-keepers, community leaders – supported the work of CICIG, and all agreed that corruption of government officials is pervasive throughout the society. The lack of the rule of law, this absence of justice, is one more factor pushing people to leave the country. While in Chaculá, we heard about regional resistance to a large hydro-electric dam that would displace many indigenous people, while channeling the electric power to other areas of the country. And we saw homemade signs reading “No a la mineria, si a la vida” (No to mining, yes to life) along the roadsides, expressing local opposition to gold and silver mines that are causing environmental damage and health problems in the area. These large mega-projects, which displace people from their land and/or pollute land and water, are another source of migration. Advocacy: Finally, we met with representatives of our own government, at the US Embassy. We presented a letter from CRLN to Ambassador Luis Arreaga, expressing our concern about the constitutional crisis in Guatemala. We urged the US to speak out more forcefully in support of the rule of law and against corruption, as they have done in the past. We also stated that, if the US wants to help end migration, they should focus their efforts on strengthening democracy, as well as the economy, in Guatemala. In Guatemala City, we met with NISGUA, an organization that provides accompaniment for human rights defenders who have received threats and builds ties between the peoples of the USA and Guatemala in the struggle for justice, human dignity, and respect for the earth. A highlight of our trip was a visit to “Common Hope,” where we were hosted by former CRLN staff member, Jenny Dale. She took us to visit a local school, filled with lively and energetic children, that is supported by CH through its programs of child sponsorship and teacher enrichment. We also stopped in a nearby village to meet a woman who had received a room addition through CH. Then Jenny took us on a tour of the CH campus, where they provide teacher trainings, health care, and a space for volunteers. The work of CH not only benefits local Guatemalans, but also provides awareness and understanding to the US volunteers who go there to work and learn. What a treat to see Jenny doing such good and important work! Another highlight of our trip was a visit to Casa de la Memoria, an interactive museum that illustrates the long and proud history of the Maya people, their experiences of repression, and their courageous resistance and resilience. We followed up with a visit to the Mayan ruins of Tikal. The grand, ancient stone temples and pyramids stand, surrounded by jungle, as testaments to the wisdom and strength of the Maya people. Their deep roots continue to provide guidance and strength as the Maya carry on their struggle for justice, equity, and peace. We are so grateful for this opportunity to learn from, and walk with, the beautiful people of Guatemala. Last year, we reported on 25 political prisoners who were jailed during the post-November 2017 protests against the rigged Presidential elections in Honduras. CRLN asked our members to participate in the campaign to free them. Today we report that most of the 25 have been released, but Edwin Espinal and Raúl Eduardo Álvarez remain in prison. We are still advocating for their release. On February 18, political prisoners Edwin Espinal and Raul Alvarez had a hearing in the national jurisdiction sentencing court in Tegucigalpa. The hearing is part of the lead-up to the trial (that still has not been scheduled) and served the following purpose: To argue the lack of due process, from the beginning, of the entire case. 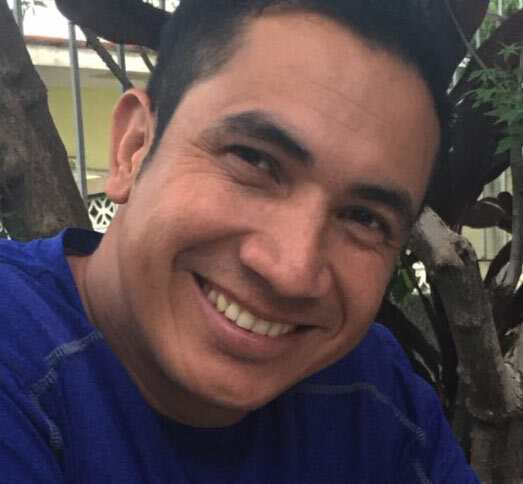 In the hearing, Edwin’s lawyers argued that the case & charges against Edwin should be annulled because the national jurisdiction court system created to try organized criminal networks and structures, does not have jurisdiction to hear the case given that Edwin isn’t part of a criminal group & none of the charges he is accused of, are related to organized crime. Raul’s lawyers requested that the case be sent to the normal court system making similar arguments. Following these arguments, the court ruled that they would not annul the process arguing that they did not have jurisdiction to hear any petitions or arguments about the case. This is also the reason that we could not proceed to a bail hearing the same day – the court simply would not rule on any petitions given their lack of jurisdiction (confirming the arguments that Edwin and Raul’s lawyers made). The recent ruling is a considered a small victory for Edwin, Raul and their supporters because the court’s ruling tells us that from the beginning, Edwin and Raul’s constitutional rights have been violated because the judges that have ruled on their case & sent them to prison previously, had no jurisdiction or legal authority to do so. Next steps: Wait until the case is admitted by the correct normal court then a bail hearing will be requested. This could happen as early as next week. Get informed before you go to vote! The Trump administration’s recent announcement that it would recognize National Assembly President Juan Guaidó as the “interim president” of Venezuela raises the stakes in already out of control crisis and increases fears of potential U.S. military intervention to back what can only be seen as an attempted coup against Venezuela’s elected president. It is clear to all serious observers of the situation in Venezuela that the Trump Administration is working closely with the right-wing opposition to find extralegal, non-electoral means to forcibly remove President Maduro from office. US efforts to undermine the Venezuelan regime over the last 20 years have brought needless hardship and deprivation to the Venezuelan people. It is time to stop. That said, as people of faith we cannot turn a blind eye to the immense suffering of the Venezuelan people under the current administration of Nicolás Maduro. We cannot ignore the violations of human rights (both political and economic) and the Venezuelan nation’s slide into authoritarianism. In all our shared faith traditions, whether Christian, Jewish or Muslim, we are called to recognize the inherent dignity and worth of every human being, to see the image of God in every man and woman. In this spirit we cannot ignore the brutal reality of extreme, deepening poverty, desperation and state violence that has become the norm for the vast majority of Venezuelans in the last several years. The current government’s inability to address the economic and political crisis that has led to mass starvation and mass migration has created a situation that is unsustainable. The Maduro government has met these challenges with violence and repression rather than solutions. As a result, the gains made by the Bolivarian Revolution nearly two decades ago are rapidly eroding. Conditions for the most vulnerable in Venezuela are now as bad if not worse than they were before the Revolution. We are all too familiar with how migration is the most glaring symptom of a broken system. We see it today in Central America. We are also seeing it in Venezuela. 1.5 to 3 million Venezuelans have fled their country and are living in desperate, appalling conditions in neighboring nations. It must be noted that the vast majority of these recent Venezuelan refugees are the poor and malnourished, not the elite of Venezuelan society, not the self-imposed “exiles” of the early days of the Bolivarian Revolution. It is these masses who suffer most as the old elites attempt to reassert their power through an attempted coup, and the new elites who amassed power and wealth through manipulation of the bureaucracies born of the revolution use state violence to maintain their control. It is these same masses who are already victims of U.S. interference in the politics of Venezuela and will die by the thousands, perhaps tens of thousands if the U.S. resorts to military force to restore its hegemony. Solutions to the current crisis can only come from the Venezuelan working class and poor whose creativity and resilience launched a revolution that gave hope to millions, not only in Venezuela but across Latin America. Only from these marginalized sectors can a path to a future beyond the poverty and violence that now engulfs their nation be defined. We here at CRLN we will continue to listen to the voices of these people. We will continue to look for genuine representatives of the Venezuelan masses with whom we can ally ourselves and make common cause. In the meantime, we must call out both the Trump Administration and the government of Nicolás Maduro for denying the dignity and worth of every Venezuelan.